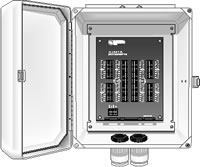 The AM ENC (pn 5633) was a 10” by 12” enclosure that contained a backplate with press-in hardware for mounting an AM32 or AM416 multiplexer (illustration shows an AM416 housed in the AM ENC). Customers wishing to "emulate" the later AM ENC can purchase an ENC10/12 enclosure with two conduits and a universal backplate. Although the AM ENC has been retired for many years, replacement parts remain available (see Ordering Info).